Let me tell you, there are few things that I offer in my shop that feel as complete and as magical as these 7 Chakra Sphere Healing Wands! 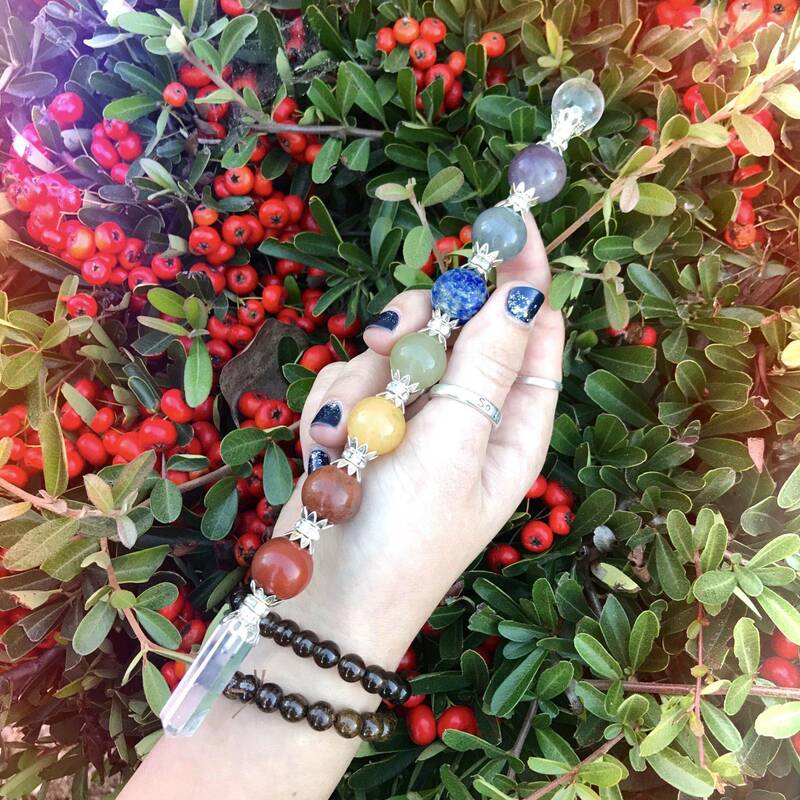 Designed to heal and rejuvenate all seven energy centers, these wands incorporate a myriad of powerhouse gemstones, each with the purpose of balancing a different chakra. Utilize this wand in meditation to align the energy centers of your body and feel your mind, body, and spirit all coming into balance. 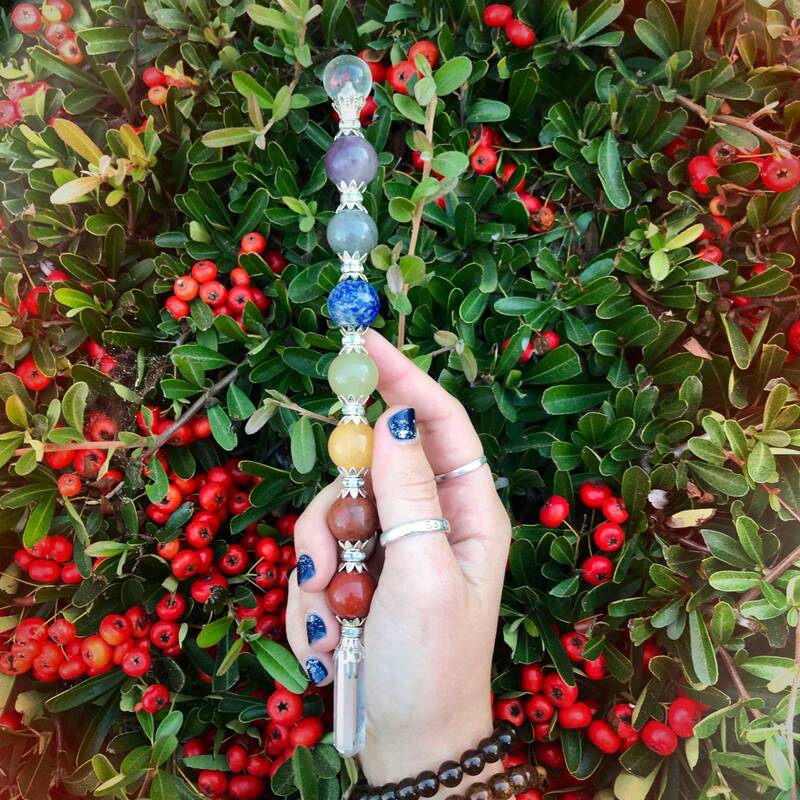 The beauty of these wands comes from the fact that they incorporate multiple gemstones, with the intent of aligning a different energy center. The first sphere is red jasper. Red jasper is known as the Stone of Endurance and is associated with the Root Chakra, which is located at the base of the spine. This chakra correlates with your feeling of safety and grounding. Red jasper is a wonderful tool for aligning this chakra and will provide you with physical strength, energy, stamina, focus, and determination. Meditate and feel the red jasper grounding you and giving you the power to set and complete goals, overcome illness, and rectify wrongs. The second sphere is orange aventurine. 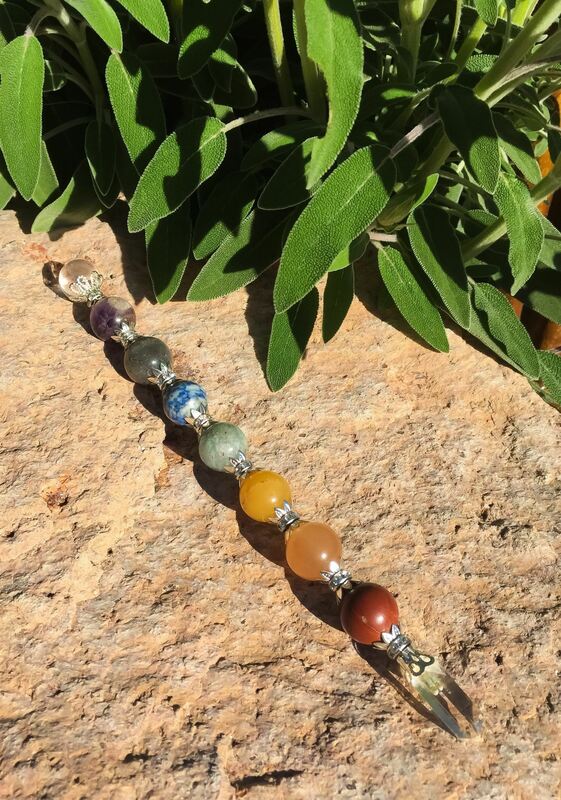 This stone is associated with the Sacral Chakra, which is located in the pelvic area and serves as the center of emotion, pleasure, passion, and intimacy. Orange aventurine is a powerful tool in meditation because it calms and stills the mind of inner chatter, making space for confidence, passion, and the power to manifest new possibilities. The third sphere is yellow aventurine, which is associated with the Solar Plexus Chakra. This chakra is located at the upper part of the belly, where your diaphragm rests and is known as the center of self-esteem, confidence, and willpower. Yellow aventurine serves to balance this chakra by allowing you to have control over your thoughts and emotional responses, set healthy boundaries, and be at peace with yourself. Allow the golden light of this stone to fill you with passion and understanding, ease your anxiety, and expand your flow of creativity. The fourth sphere is green aventurine, which is associated with the Heart Chakra. Located at the center of the chest at the heart level, the Heart Chakra governs the parts of our being that have to do with compassion, love, and beauty. Green aventurine aligns this chakra by relieving emotional wounds and facilitating the release of unhealthy relationships. When you meditate with this wand, allow the green aventurine to comfort you and heal your heart, providing you with a feeling of optimism, joy, and emotional calm. The fifth sphere is lapis lazuli, which is associated with the Throat Chakra. This chakra is located at the center of your neck at the throat level and is known as the center of expression, communication, and wisdom. If you often find it difficult to express your emotions and needs, pay close attention to this particular gemstone and chakra while meditating. This powerful, protective stone will stimulate objectivity and mental clarity and will aid you in self-expression while helping to reveal your inner truth. The sixth sphere is blue aventurine, which is associated with the Third Eye Chakra. This chakra is located on your forehead, between the eyebrows, and governs vision, intuition, memory, and imagination. An overactive third eye chakra can result in insomnia, depression, anxiety, and migraines. If you find yourself suffering from these symptoms, focus on the blue aventurine sphere of this wand, and allow it to calm your third eye chakra and combat imbalances within it by promoting peacefulness, happiness, and contentment. The seventh sphere is banded amethyst, which is associated with the Crown Chakra. This chakra governs your sense of connection to the Higher Realms. When it is aligned, you feel serene and faithful, deeply connected with your angels and spirit guides. To align this chakra, focus on the banded amethyst sphere of this wand and feel your connection with Spirit deepening. Lastly, the wand is topped with a sphere of clear quartz. Clear quartz is a gem of magnification and intensification, and it serves to amplify the magic of the other stones found in these wands. These wands also feature a handle at the bottom made of a clear quartz crystal, making the energy of the entire wand balanced and extremely powerful. I can’t tell you enough how incredible these wands are for meditation. By giving you a powerful stone for every single energy center of your body, your wand will align your mind, body, and spirit, and bring you a sense of peace you have never known before. This listing is for one (1) 7 Chakra Sphere Healing Wand, about 9” in size. Yours will arrive lovingly parceled along with a single leaf of white sage and a parchment describing the properties of the stones. This 7 Chakra Sphere Healing Wand is Amazing! This 7 Chakra Sphere Healing Wand is exquisite. Sturdy and well made with beautiful stones. It’s a very loving and soothing piece. I am very happy to add this to my collection. I really love this piece and the energy from it. One of my favorites. This wand is so beautiful and has powerful energy! I love it!! Shipped exactly as pictured. Love the quartz on the tip. It is quite powerful!